Past Clear Lake Chamber Chairman Richard Allen, left, will chair the chamber’s upcoming 50th Anniversary Chairman’s Ball, set for Friday, Oct. 19, at Space Center Houston. 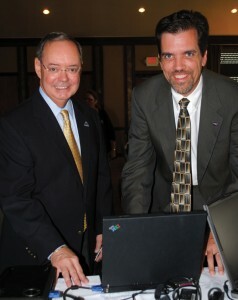 Here, he updates Johnson Space Center External Relations Director Mike Kincaid on the event at last month’s chamber luncheon. 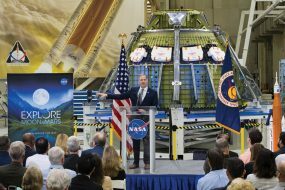 HOTTEST TICKET in town these days is one to the Clear Lake Area Chamber’s 50th anniversary Chairman’s Ball on Friday, Oct. 13, at Space Center Houston. Besides “Celebrating One Golden Evening and Fifty Golden Years,” the black-tie evening will honor the chairman of the board, Lockheed Martin Senior Project Manager Joe Mayer and the incoming chairman, My Flooring America Vice President Mike Furin. State Rep. John Davis will serve as emcee with Judge Holly Williamson swearing in the new officers and directors and entertainment by the Jill Rauscher School of Dance and Phil Pampolina’s PRP Entertainment. SAIC Communication Director Joyce Abbey is chairman of the anniversary planning committee and Past Chamber Chairman Richard Allen is chairing the gala. Tables range in price from $1,200 to $3,000 with individual tickets at $95. For details, call, the chamber, 281-488-7676. 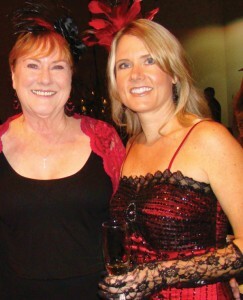 Ellen King, left, and her daughter, Karen Weber, will chair this year’ Bay Area Houston Ballet & Theatre Serendipity Ball, coming up Saturday, Oct. 13, at Space Center Houston. 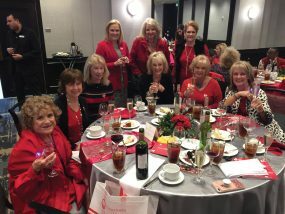 • Just A Pretty Table, the popular Bay Area Museum Guild benefit luncheon, starts things off at 10:30 a.m. Wednesday, Oct. 3, when Guild members show off their talents decorating luncheon tables at Bay Oaks Country Club in Clear Lake. They go all out, even asking their guests to carry out the theme in their dress, so a Halloween themed table will probably be filled with goblins and witches. • UH-Clear Lake Alumni Association will host its annual Alumni Celebration Saturday, Oct. 6, at Space Center Houston, honoring some of its outstanding grads and recognizing the extraordinary accomplishments and service of these graduates and faculty members. 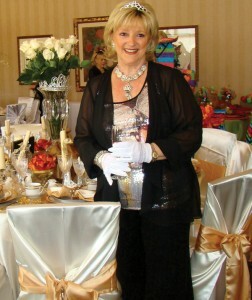 Era Lee Caldwell stands by the table she decorated for the Bay Area Museum Guild’s 2011 Just A Pretty Table. 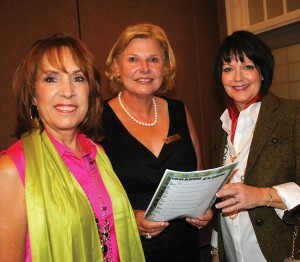 This year’s benefit luncheon is at 10:30 a.m. Wednesday, Oct. 3, at Bay Oaks Country Club in Clear Lake. Dress is black-tie optional and tickets are $65 — $50 for students. A cocktail reception, with cash bar, kicks off the event at 6:30 p.m., followed by dinner and the awards presentation at 7 p.m.
• The Bay Oaks Women’s Association members will turn their thoughts to the holidays on Tuesday, Oct. 2, at the country club when Friendswood florist Lynn Lary McLain unveils her fabulous Christmas Tree with holiday songs. 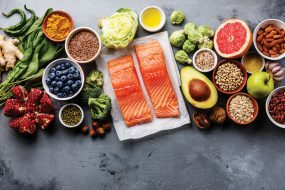 This is the perfect time to come catch up with friends over brunch and mimosas, President Terri Devine says. • Space Center Rotary will host its 38th annual Sprimporee and Auction from 11 a.m. to 4 p.m. Saturday, Oct. 20 in Clear Lake Park’s Landolt Pavilion. Admission is free with shrimp and barbecue brisket plates available for $15 each and the Women of Rotary Bay Area offering desserts. As always, there’ll be plenty of entertainment for the wee set, plus a raffle and live and silent auctions for mom and dad – a whole big afternoon of fun and frivolity. Proceeds will benefit Smith Family YMCA, FirstAct Early Knight Program and Communities in Schools-Bay Area, Chairman Sheryl Berg tells us. 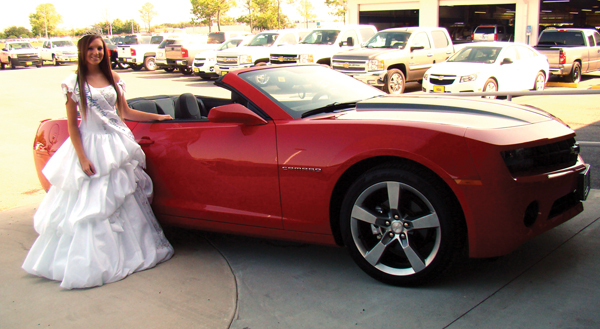 Lunar Rendezvous Queen Caitlin Hutson gets ready for a ride in her new Camero at Norman Frede Chevrolet. Her dad, John Hutson, bought the sports car for her as a birthday and graduation present. Bay Oaks Women’s Association Vice President Joan Burt, center, says hello to models Mary Colombo, left, and Annette Dwyer, as they await the start of the annual Fall Fashion Show. All three serve on the BOWA Board. For questions, call the chairman, 281-773-3598. 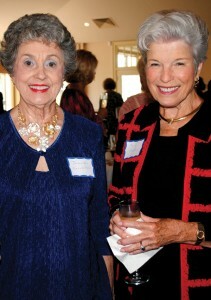 NOTHING LIKE FASHION to get the attention of Bay Oaks Women’s Association members. They were out in force the other day for BOWA’s annual fall fashion show luncheon featuring the latest trends from Dillard’s at Baybrook Mall. Early arrivals included Wanda Kelly, Rhonda Smith, Sharon Christman, Sharon Phelps, Jeannette Koerschner, Mary Keathley, Gloria Wong, Barbara Coleman, Barbara Rosenthal and Marilyn Lunney, who were signed in by Sharon Dillard after being welcomed by Lucille Terraso, Danele Buehler and Sandy Lantz. 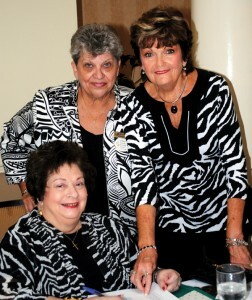 Sharon Dillard, seated, Carol Gurgos and Sandy Lantz, from left, check over the reservations for the Bay Oaks Women’s Association Fall Fashion Show to be sure they are all in sync, as their outfits are. Vice President Joan Burt winged in from California for the luncheon and before long was busy saying hello to Jonell Hunter, Jo Cat Bruce, Judy Ferguson, Judy Raiford, Courtney Atchley, Kay lee Benoit, Gladys Jones, Sheila Cooper, Angie Weinman, Rita Johnson, Diane Konick, Carlene Langford, Phyllis Tharp and Carol Bobo. Across the way, you might have spotted Jennifer Simmons, Elenor Walters, Betsy Salbilla, Georgia Piwonka, Gia Warner, Libby Jones, Mary Ann Shallberg, Betty Woodhouse, Amy Bacon, Lynn Glazner, Dorothy Benjamin, Ann and Ondi Lyon, Debbie Roan, Karen King, Julie Gross, Sue Ferguson, Laurie Petty and Sonja Moore. Before long, it was time for models Jeri Knapp, Lea Bodie, Dee Wolfe, Mary Colombo, Veronica Hernandez, Janet Greenwood, Annette Dwyer, Patt Simon, Brandy Miller and Kimberly Weathers to show off what hot in the fashion world. 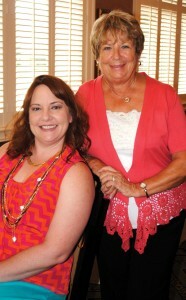 Jeannette Koerschner, left, visits with Mary Keathley as they arrive at Bay Oaks Country Club for the Women’s Association’s Fall Fashion Show Luncheon, featuring fashions from Dillard’s at Baybrook Mall. Much to the delight of Diane Overman, Ann Brady, Nell Veazey, Ruth Beecher, Jill Reason, Lynette Mason Gregg, Ann Zeller, Cindy Woodall, Sue Lyons, Cherre House, Linda Demasie, Ann Dooley, Fran Gentry, Martha Meas, Barbara Dickey, Badiha Nasser and Jill Williams, who were among the many enjoying the style show luncheon. THE CLEAR CREEK Education Foundation has announced its honorees for its 20th anniversary Reach for the Stars Gala Saturday, Nov. 3 at South Shore Harbour Resort with Dr. Jim O’Malley to be presented the Citizen of the Year Award and Lisa Holbrook the George Carlisle Award. Kimberly Weathers, left, chats with Sharon Christman backstage as they wait to model in the Bay Oaks Women’s Association’s annual Fall Fashion Show at the country club. Both serve on the BOWA board. Outstanding Alumni Award recipients are Clear Lake Chamber President Cindy Harreld, attorney Scott Krist, Dr. Lloyd B. Potter and a Dallas financial officer, Susan Hayes Witty; with the Valor Award going to Bryan Escobedo and Teachers of the Year Jennifer Foley and Nicola Clemmer to be honored with Super Star Awards. O’Malley, a retired Exxon Chemical executive, is a former chairman of the education foundation.